Remember when banks used to give out free calendars every year showing exotic locations you could fantasize about? There was one that featured a Cunarder anchored in the middle of a Norwegian fjord with beautiful honeymooners leaning over the rail swooning at the beauty of it all. Now you can live out your fantasy by journeying to Southampton, UK and boarding Cunard's Caronia on a 12-day cruise called Reflections in the Fjords. Caronia is not a floating mega-city. She is a 24,492-ton classic liner, built at a time when real wood was used lavishly, and the term glitter-and-glitz had yet to be invented. The hospitable staff is reminiscent of that of England's finest hotels, where everyone remembers your name, and the bartender knows how dry to make the martini. 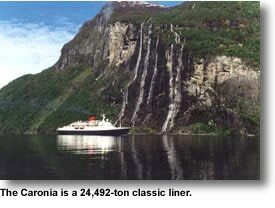 Lest the idea of The Golden Age of Travel set your teeth on edge, rest assured that the Caronia underwent a $5 million refurbishment in 1995. The cabins are up-to-date and have TVs with the major BBC stations in real-time. The passenger profile does not include many honeymooners draped in confetti. The Caronia doesn't cater to swingers, singles, or families with children. Passengers are primarily an older crowd, 70 percent British with American and German travelers making up the balance. Many have taken the ship numerous times to all its destinations and are addicted to the intimate, friendly ambience. Due to the foot-and-mouth disease scare in Europe, the maître d' quickly informs diners that all meat is imported from the U.S. He also adds, almost ruefully, that even when the Caronia did its New Zealand run, this ship's lamb still had to come from Colorado. Plagues aside, the food is wonderful. 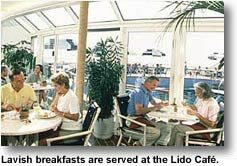 On the rear deck is the Lido Café, an informal restaurant that serves lavish breakfasts including omelettes made to order as you stand by and kibitz. The main restaurant, the elegant Franconia, features such delicacies as lobster, caviar, and prime Kansas beef. There's also Tivoli restaurant, which you should book the minute you get on board. It serves authentic Tuscan cuisine and has a beautiful view from the sun deck. There are endless activities onboard: sunbathing alongside the pool, exercising in the fully equipped gym and health spa, going to the cinema, listening to a lecture on tomorrow's port of call, attending a cabaret or classical chamber concert, trying your luck at the casino, or reading and admiring the Ice Age glaciers at the same time. The Caronia has ten ports of call, but a few stand out from the rest. At the Hanseatic Museum in Bergen you can about all the things you may have slept through in college. You can also sail through the spectacular fjords en route to Geiranger and count the abandoned farms that look like dollhouses in a child's nursery. Take a bumpy cart and mountain pony ride up to the world's largest glacier in Olden. Spend an unforgettable day in Trondheim attending a baroque organ concert in the Gothic Nidaros Cathedral, then visit the nearby Resistance Museum. 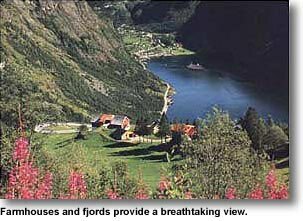 The main reason to take the fjord cruise is that it is a pure fantasy of unspoiled natural beauty. No painting, photograph, or movie could capture the splendor of the vertical cliffs, the waterfalls, and the postage-stamp farms, miraculously clinging to the hillsides. Not even those old bank calendars. For more information or Cunard reservations, call 1-800-7-CUNARD in the U.S. or visit www.cunardline.com.